This is a talk – a Pecha Kucha style one – that I gave at EPIC 2013 in October. I gave it in 6 minutes and 40 seconds. I suspect having a little more time would have helped, but that’s not the format. Here’s a more leisurely version. 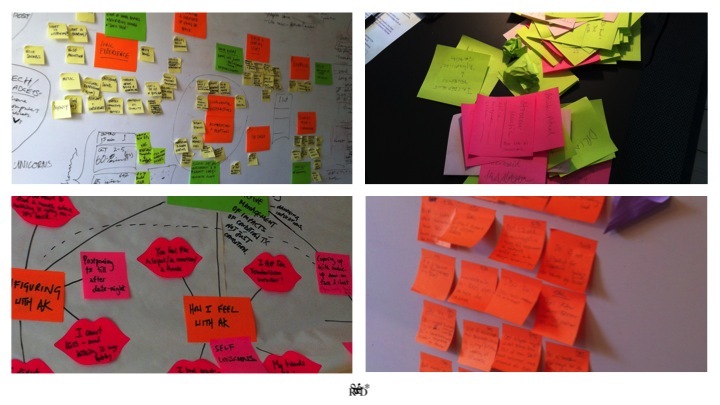 Being an organiser of EPIC I had very little time to prepare my talk, and getting to that task late in the day I quickly discovered that the story I had wanted to tell initially – about post-its in a boarded up window – would look a little different, and more interesting. 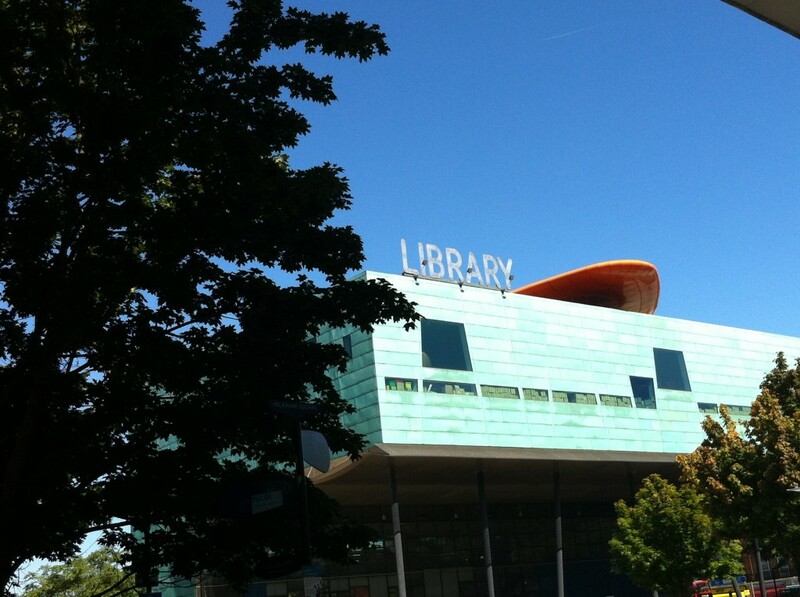 The Peckham Peacewall had been made permanent by a local artist and installed in Peckham Space, next to the the landmark library. 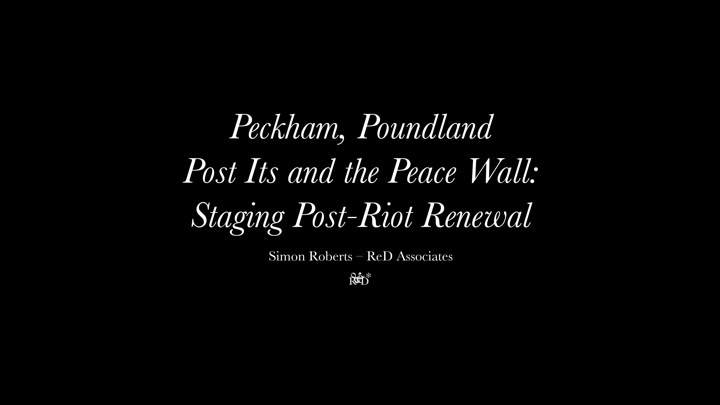 Acknowledgments: Many thanks to Chris Ratcliffe at Garudio Studiage for his time and help in telling me the story of the Peacewall, and to Rebecca Cahill at Peckham Shed and John Clare for permission to use their photographs. 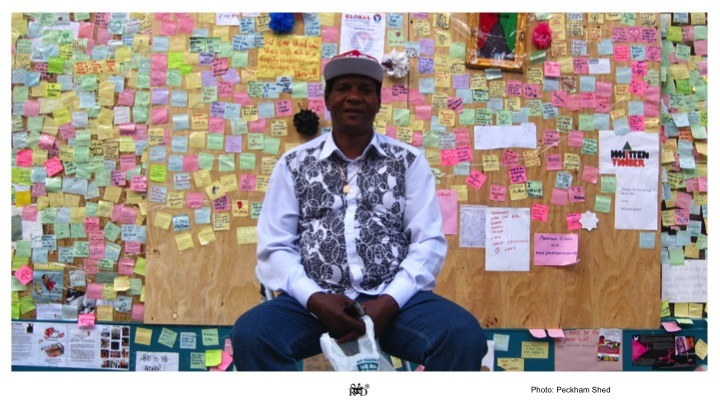 And, of course, credit should go to the people of Peckham Shed who created the Peacewall in the beginning. “What are the roots that clutch, what branches grow out of this stony rubbish?” – T.S Eliot, The Wasteland. This talk asks what comes out of riot and what tools are used to effect a renewal? 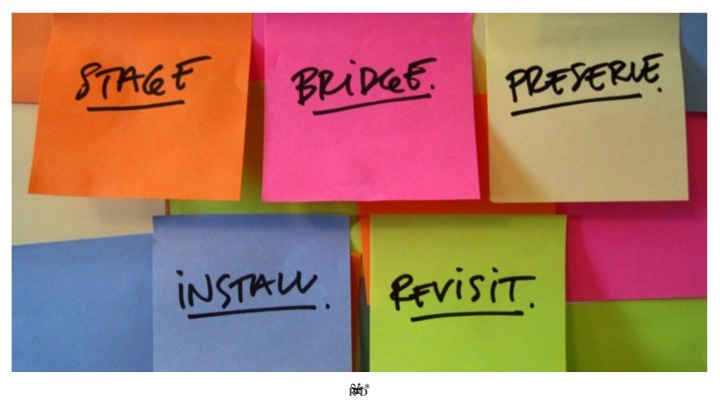 Many of us (people who do research, do ‘innovation’ or work with ideas, and many others besides) use post it notes everyday. They are a tool and a totem of our work – markers of the fact that we interpret and organize data and create ideas. They are symbols of a professional caste. But what happens when they turn up in a rather different setting – what uses are they put to and what sort of lives can they have? Let’s start at the beginning. August 2011. I’m at home in Peckam, south London. I went outside to see what was happening and why there was a helicopter hovering above us. I saw a ploom of smoke and given that London was being convulsed by rioting and looting I thought I might learn more on TV. That week in August a large number of areas in London and other major British cities experienced severe unrest following the death of Mark Duggan who was shot dead by the police in Tottenham, north London. Trouble had broken out in Peckham. On TV I discovered that there was looting and arson taking place 5 minutes away from home on Rye Lane. Greggs the Bakers was on fire and many shops had been vandalised. Peckham is a traditional London working class community, albeit one showing signs of gentrification of which, being a resident, I guess I am evidence. It is ethnically diverse, with significant populations from Bangladesh, the Caribbean, China, India, Ireland, Nigeria, Pakistan, Eastern Europe and Vietnam. 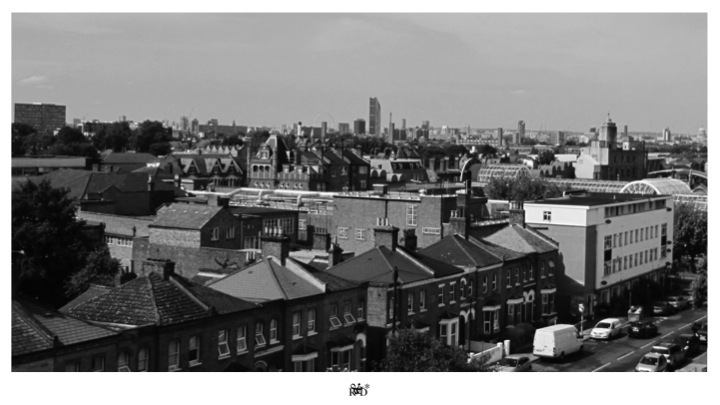 Despite the arrival of bars, bistros and bohos the geographical and social heart of Peckham is Rye Lane. It was Rye Lane where most of the looting and arson occurred and where the Peckham Peacewall emerged the following day. Members of a local theatre company, Peckham Shed, who work with teenagers in Peckham headed to Rye Lane to participate in the clear up. This was a process replicated more widely around London as communities ‘struck back’. Seeing the boarded up window of Poundland, a discount store, they thought it would be a good idea to get people to express their opinions about what had happened in Peckham. 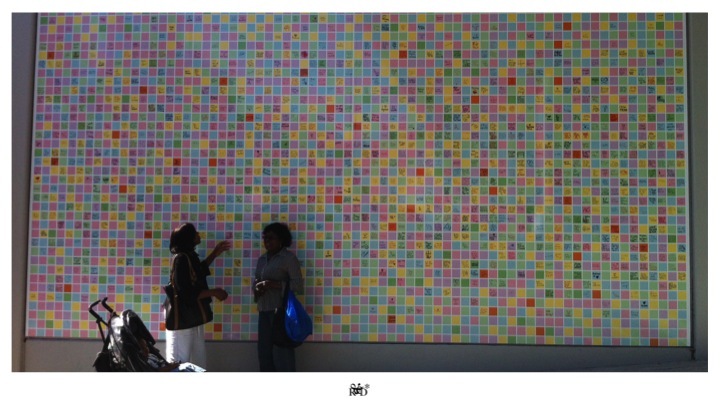 The result was an array of four thousand post its inscribed with a wide variety of messages displaying mainly positive feelings about Peckham. Thoughts built on thoughts, statements on statements, in a way that perhaps we’re all familiar with. 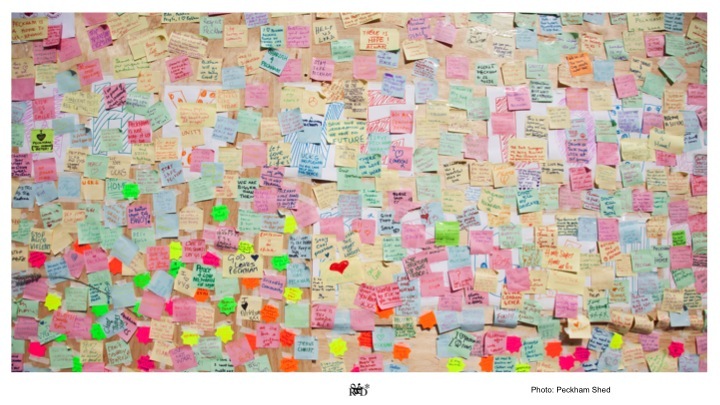 Certain themes and feelings predominated, often forming in clusters where groups of friends or families built on each others’ post its. 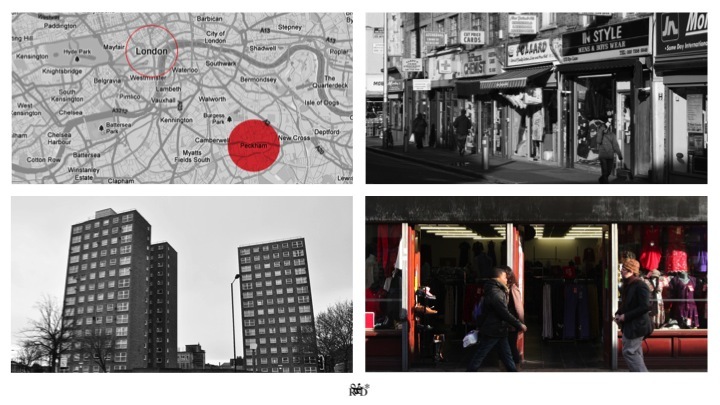 So, in many respects, the post its of Peckham were similar to the post its that we are familiar with. They make voices and opinions tangible, they allow voices that might not be heard to be represented, they state intent. They inscribe identities, subjectivities and statuses. 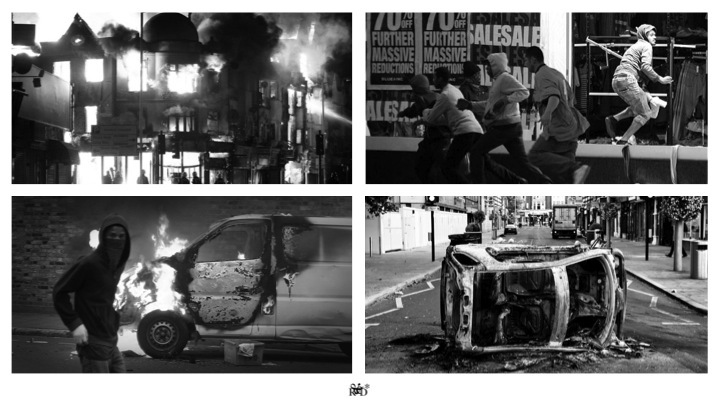 Riots subject people to violence perpetrated not by a distant and abstract enemy but by their own community and riots challenge people’s sense of understanding of their community. In this context, anthropological studies of riots (e.g., Veena Das‘s Mirrors of Violence), have spoken of one task confronting the impacted community as being the need to reformulate their world, by establishing a bridge between the self and the world, and of connecting a ruptured past with visions of the future. 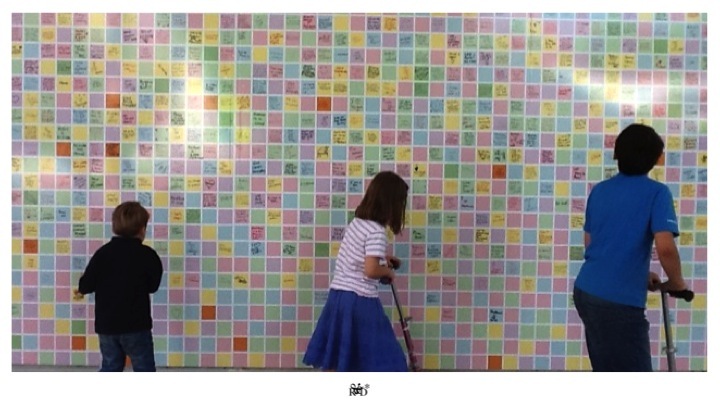 The Peacewall was quickly picked up by the national media. But this being Britain in the summer, rain and a strong breeze started to damage it. And when council workers came to remove it there were fears and some anger that they were going to destroy it and that they were acting on Council orders to have the wall destroyed since it represented a bad (and possibly lasting) image of the area. One man who lived in a flat above a shop opposite had taken it upon himself to ensure that no one damaged it. The Wall had become a strong symbol of one community’s overwhelmingly positive response to the convulsions of the previous days. And I guess that’s how it is for most Post it notes. They have short and somewhat inglorious biographies – a brief moment of glory encapsulating a thought, an idea, or even an insight. Physically they peel, they float to the floor and the tearsheets they’re attached to are rolled up and discarded. Theirs is a life of impermanence – they’re merely bridge to something more lasting. 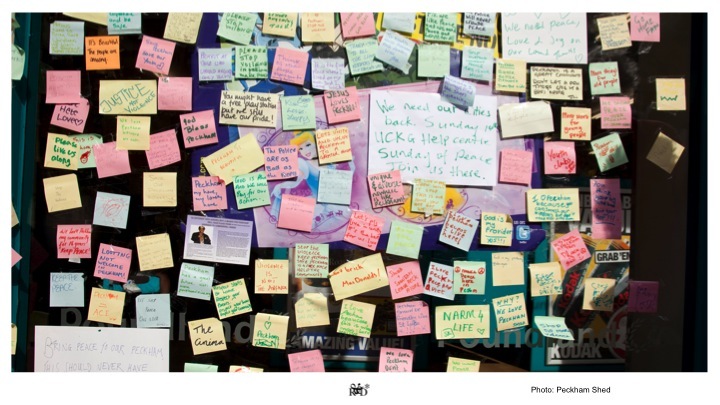 But the post it notes that were produced in Peckham’s community brainstorm were destined for a different sort of life. A local artist, Chris Ratcliffe, was determined to ensure that voices that had found expression through the Peacewall could be heard long term. 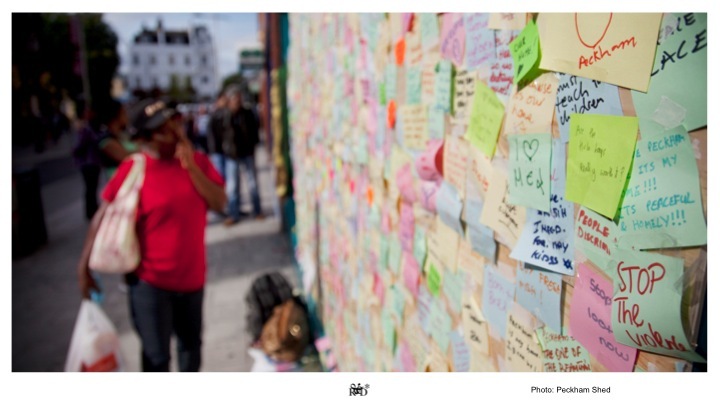 He had recently been working on a project designed to get residents of the area to engage with creating a long term vision for Rye Lane and surrounding areas, and the Peacewall offered itself as perhaps another set of evidences about how people felt about their community. 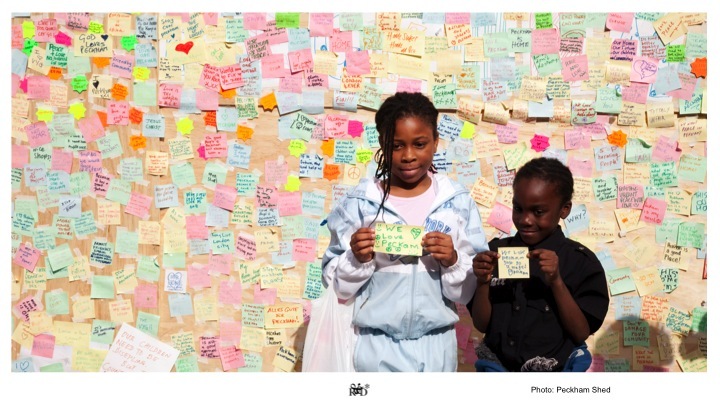 This urge to preserve resulted in the Peckham Peacewall. Funding was sought for a project to recreate the wall in a more permanent form. 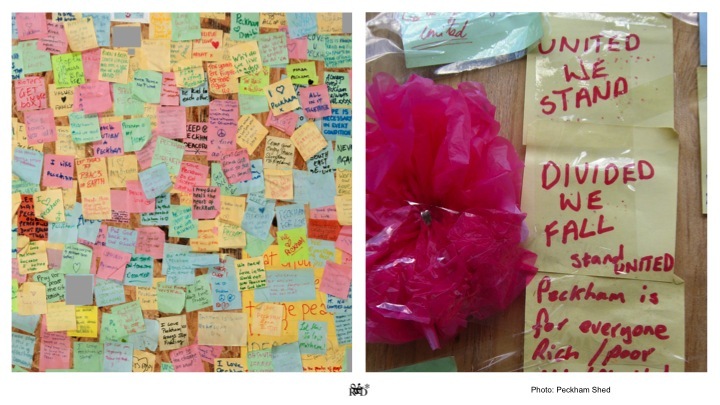 Local teenagers from community groups were recruited to trace over each and every post it note in order to ensure that both the original messages, but the distinctive calligraphy of each and every contributor could be captured. Chris had toyed with the idea of printing the content in a uniform text but instead wanted to allow people to return to the wall and easily find their own messages. The tracing paper was scanned and the post its were organised into a formal grid. The ’tiles’ were then printed on a large format laminate material. 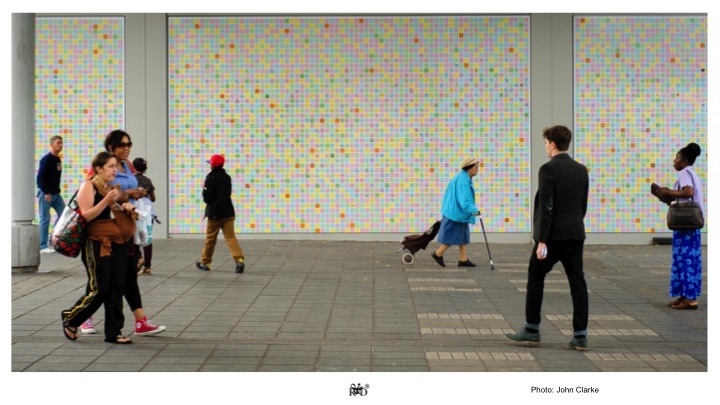 The post its were arranged in a grid and printed on a laminate material – and installed in a public space near to Peckham’s pubic library on what had previously been a rotting chipboard partition. The material is guaranteed to last at least 10 years. 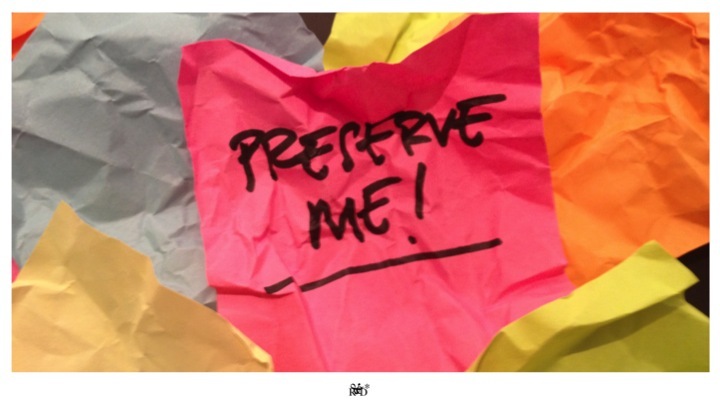 Permanence of this sort is not something that the average post it enjoys. Chris left blank post it notes throughout the grid on which things can be written. 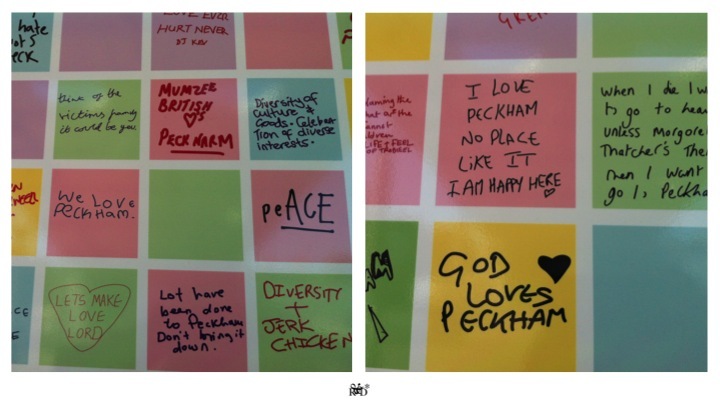 And people are writing on them, nearly always reaffirming their positive view of Peckham. The Peacewall successfully manages to be both a memorial to a moment in time and a place for that memory to be continually enacted. That bridge between self and community, past and future that accounts of life after a riot suggest is so important, has been constructed. The post notes we use in our everyday work practice, I suggest, do somewhat similar things. They act as bridges between research and analysis, between people and their ideas, they act as means of staging ideas and giving voice to fragments of thoughts and concepts. But most often they are highly expendable tools – bridges that we can, to use a military image, blow up behind us as we advance. Sometimes, I hope I’ve demonstrated, there are reasons why sometimes making them a permanent can make sense too. I would suggest that in Peckham this is certainly true. 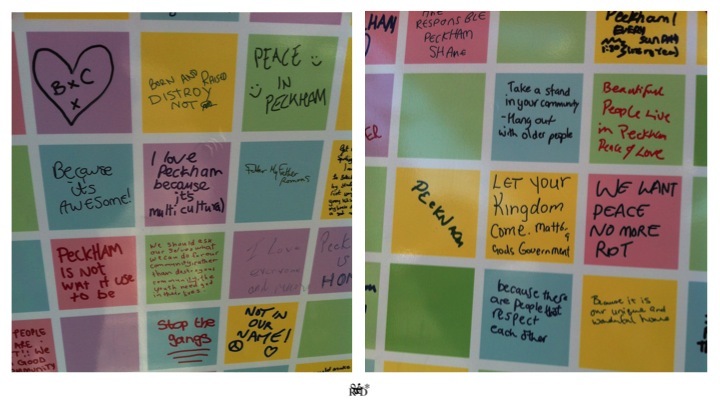 The Peckham Peacewall has made a permanent place of memory to a violent episode in a community’s recent past and its strong, willful response to it. My children didn’t quite understand what was happening around them the day, or the morning after the riots. But they enjoy going on their scooters to read the post it notes at Peckham Space. And they are, I would hope, not alone in finding the Wall both informative, full of local expressions (as well as quite fun to visit). 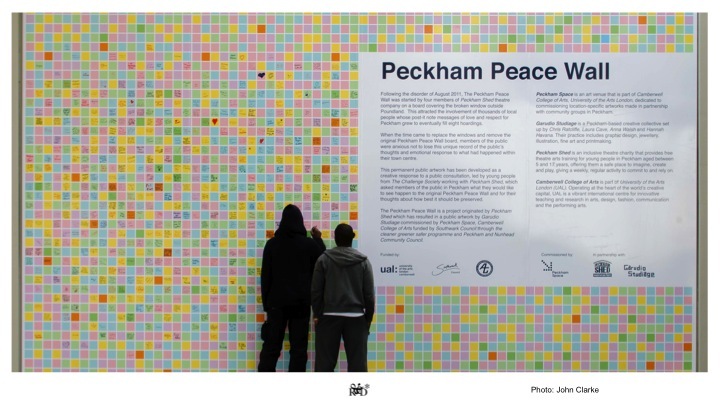 The Peacewall is now an icon of Peckham that points to a brighter future – it really does act as a bridge between a violent episode in the past and an area of London looking forward. This entry was posted in Current Affairs, Peckham, Politics. Bookmark the permalink.